England Offering Free HIV Treatment For Visitors : Shots - Health News The National Health Service is providing care for short-term travelers. So if you're on holiday and run out of an HIV drug, the NHS will help out, gratis. But if you're thinking of going for a long time to get free care, you're probably out of luck. 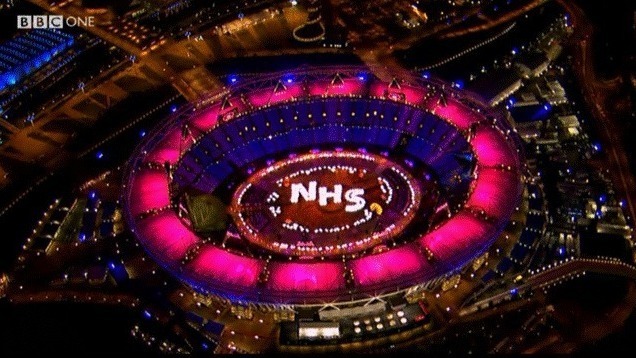 Outsiders might be unfamiliar with the U.K.'s National Health Service, but Brits love it so much that they devoted part of opening ceremonies at the 2012 London Olympics to the NHS. We're just catching up with our U.K. reading list, so we're a bit late with this one. But it's worth noting that as of Oct. 1, England's National Health Service is providing treatment for HIV free of charge to visitors from overseas. NHS guidelines cover short-term visitors as well as people living in England "without lawful permission." This latter group is seen as "presenting most risk in terms of having untreated HIV infection since they risk transmitting HIV to an uninfected person." New information that we've been reporting all year shows the spread of HIV can be radically reduced by giving everyone with HIV treatment. But if you're HIV-positive and in need of help paying for your drugs, think twice before you click on over to Travelocity and become undocumented in England. Section 4.6 of the guidance states, "There are no provisions under the Immigration Rules for a person to travel to the UK in order to access the NHS." So if you happen to be visiting and you are in need of HIV treatment, say, because you ran out of a drug or you wind up in a hospital because of HIV, the NHS will help out, gratis. But if you fly into Heathrow intending to stay a long time just to get free care, you are probably out of luck. The NHS sends a bill to people who don't fall under its rules. According to the National AIDS Trust, if you aren't in the United Kingdom legally and have an unpaid NHS debt of above £1,000, the U.K. Border Agency will get involved. The new rule only applies to NHS operations in England. The NAT is asking the policy be expanded it to Scotland, Wales and Northern Ireland. By the way, all tourists visiting the U.K. — HIV-positive or not — get free NHS treatment when it's an emergency, regardless of their immigration status. That's not the case in the U.S., where international visitors who show up at the emergency room either have to show proof of insurance coverage or pay up.